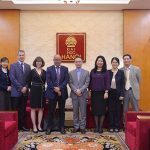 On July 3, 2017, representatives of Japan-based Seven-Eleven Ltd., led by Mr Yasui Makoto, Director General of Human Resource Development, visited and worked at Hanoi University. 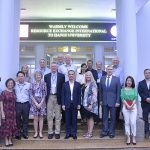 Joining the delegation with Prof. Dr Nguyen Dinh Luan – President of the University, there are representatives of the International Office and the Vietnam-Japan Cooperation Center. 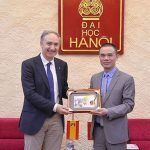 At the meeting, Mr Yasui Makoto expressed his desire to establish cooperation with Hanoi University. Accordingly, Seven-Eleven Japan Ltd. will organize internships at Seven-Eleven stores for students of Hanoi University. The aim of the internship program is to help them practice and improve their Japanese language skills while learning about business, accounting, management … and to familiarize themselves with the professional working environment of Japan. 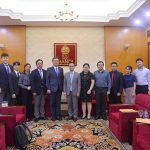 In returns, Prof. Dr Nguyen Dinh Luan appreciated the cooperation proposal from representatives of Seven-Eleven Co., Ltd. Japan and fully supports the strategy of human resource training development of the Company. 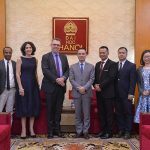 Appreciating the feasibility of this opportunity of cooperation, the President of Hanoi University hopes to have more employment opportunities open to HANU students when specific cooperation activities are in place. At the end of the meeting, the leaders of the two sides agreed to promote the signing of the cooperation agreement in the future to create the foundation for cooperation between Hanoi University and Seven-Eleven Japan Ltd.
Seven-Eleven is the name of a well-known international chain of convenience stores operating under the franchise. By the end of 2016, the 7-Eleven chain stores have been present in 17 countries with approximately 61,500 points of sale. The parent company of this brand is Seven & I Holdings Co., Ltd. This is a Japanese multi-disciplinary retail corporation founded in 1920 and headquartered in Chiyoda-ku, Tokyo, Japan. On 15/6/2017, this brand has officially opened its first store in Ho Chi Minh City and is expected to expand its business in Hanoi.